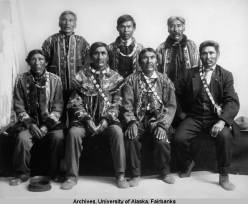 John Minook Family and Home, from the Alaska and Polar Regions Collections, Elmer E. Rasmuson Library, University of Alaska Fairbanks. The 150th Anniversary of the Treaty of Cession with Russia provides an opportunity to examine what the purchase of Alaska meant for Alaska Natives. The language of the treaty demonstrates how the United States and Russia thought about, classified, and legally established the conditions of life for Alaska Natives. The critical language is in Article III where the residents of Alaska were classified as either “inhabitants” or “uncivilized tribes.” The former were all who were of full or part Russian ancestry and those living as Russian subjects. The “uncivilized tribes” were the Native peoples who were distinguished both by virtue of their lack of European ancestry, their distance from Russian control, and by the way they were living. The inhabitants were granted United States citizenship if they wished to stay. The “uncivilized tribes” were considered unworthy of legal recognition as citizens because their way of making a living, their social relations, and their knowledge of “white man ways” was considered inferior. In practice, in the years following the Treaty, most Natives were denied the rights of citizenship unless they could prove Russian blood, that they had given up tribal ways, and were living like white men. Based on the Treaty of Cession, all matters pertaining to the Alaska Native peoples were subject to the United States government who assumed responsibility in decisions about land, resources, and their general welfare. In an 1870 Treasury Department report, Captain Charles Bryant, Special Agent of the Treasury Department, stated that the Tlingit never recognized the Russians as owning their land and that they held that the Russians should have at least consulted them about the sale. 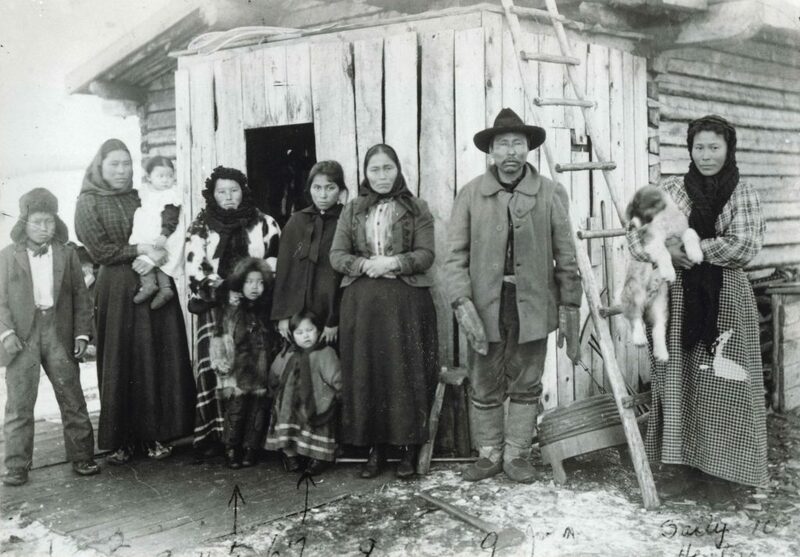 For the most part, the lack of legal citizenship and civil rights did not emerge as a problem for Alaska Natives until conflicts arose over natural resources, land, and waters the Native people depended upon for their livelihood. The first conflicts over land occurred in Southeast Alaska but spread north to the Interior with the large number of prospectors during the Gold Rush. The prospectors wanted to “own” their claims and they didn’t see that Alaska Natives had any legal rights to stake claims. The only legal protection Natives had for the land they used was a clause in the 1884 Organic Act that stated that Natives were not to be disturbed in their use of the land. Natives who attempted to stake claims were denied because they were not legal citizens. John Minook became a test case. He was a miner of both Russian and Native blood and in order to hold his mining claim in Rampart, Alaska he had to apply for citizenship and demonstrate that he was living a “civilized” life. Minook was finally granted citizenship in 1904 based in part on his Russian heritage but also on the fact that he and his family were living “civilized” lives. One year later, Judge Wickersham would rule in the Berrigan Case involving prospectors and Natives on the Little Delta River. Wickersham ruled that the prospectors could not buy land from the Natives nor could the Natives sell land because the Natives’ land claims had not been determined and settled. As Kevin Illingworth, professor of Native law, has pointed out, this ruling is important not only because it upheld Article III of the Treaty of Cession but also because it established the government’s responsibility to protect the Natives from exploitation of the land they used. Further, some argue it recognized that the issue of Native land claims needed to be settled at some point. From a practical perspective, Wickersham’s ruling is seen as a way to protect Native rights. Considered in this way, the Berrigan ruling, emanating from the Treaty of Cession language, provides a step toward recognizing Native rights. It is no wonder then that a central topic of the Tlingit Chiefs’ meeting with Governor Brady in 1898 and the 1915 Tanana Chiefs’ meeting in Fairbanks was their concerns about what they could expect from the government. The Treaty had left the Native people in a strange limbo. The Gold Rush had stirred government response but not resolution on pressing issues faced by Alaska Natives. Alaska Natives found themselves in a new relationship to the white society that engulfed them. Government-to-government relationships needed to be built. As we know now, it would be many years before citizenship was easily accessible for Alaska Natives; it would be even longer for there to be anti-discrimination laws, and still longer for a land settlement for all Alaska Natives. For this to happen, American society had to evolve in its thinking about civil rights. Despite achievements in this area, Alaska Natives have to continue to explain their way of life and press their claims through the legal system. Bryant, Charles. “Report as Special Agent of the Treasury Department,” 14. S. Doc. No. 32, 41st Cong., 2nd Sess. (1870). Case, David. “The Russian Legacy of the Alaska Native Claims.” In Russian America: the Forgotten Frontier, edited by Barbara Smith and Redmond Barnett, 237-243. Oregon: Washington State Historical Society, 1990. Case, David and David Voluck. Alaska Natives and American Law, 67. Fairbanks: University of Alaska Press, 2012. Cohen, Felix S. Felix S. Cohen Handbook of Federal Indian Law, 404. Five Rings Corporation, 1986. Hinckley, Ted. “’The Canoe Rocks- We Do Not Know What Will Become of Us’, the Complete Transcript of a Meeting Between Governor John Green Brady of Alaska and a Group of Tlingit Chiefs, Juneau, December 14, 1898.” Western Historical Quarterly 1, no. 3 (1970): 265-289. Wickersham, James. Alaska Reports, Volume 2, Containing the Decisions of the District Judges of Alaska Territory From January 1, 1903 to January 1, 1906, 200-224. St. Paul: West Publishing, 1906. William Schneider is professor emeritus at University of Alaska Fairbanks. This and other issues are explored in more depth in his forthcoming book from UA Press, The Tanana Chiefs: Native Rights and Western Law. It is scheduled to be out in March 2018.